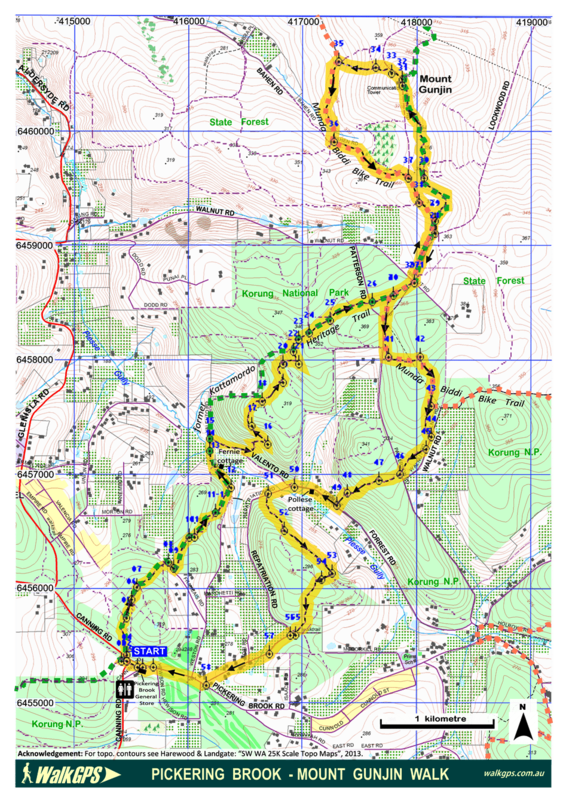 This is a longer walk option which mostly overlaps with and extends the shorter Pickering Brook Walk (Walk P1) by 5.5km in the north to take in a visit to Mt Gunjin in the north. The Pickering Brook-Bickley area with its several little hills and valleys, offers walkers variety of a different sort than in most other walk areas in the Darling Range; The forested areas on the higher ground (mostly within Korung National Park), are pleasantly broken by picturesque orchards and farmland in the small and narrow, fertile valleys. In spring, the blossoming orchards, along with the usual emergence of wildflowers make any walk in the area especially colourful. Two old cottages passed on the walk route also provide a reminder of the post-WW1 role of soldier settlers in the settlement along Piesse Brook. The Pickering Brook-Bickley area offers walkers variety of a different sort than in most other walk areas in the Darling Range; Here the sections of walking through jarrah-marri forest on the higher ground (which lies mostly within the newly named Korung National Park), are pleasantly broken by short sections that skirt picturesque orchards and farmland in the small and narrow, fertile valleys, including Piesse Gully. The route also passes close by two old cottages dating back to the 1920’s, a reminder of the post-WW1 role of soldier settlers in the settlement of the area. In spring the emergence of wildflowers and the adjacent blossoming orchards makes any walk in the area especially worthwhile. The new walk route described here is all on-track and is a combination of short sections of the Kattamordo Heritage Trail, old forestry trails, and newer mountain bike trails which pass through some nice sections of forest. The terrain is varied with a few short, steepish hill climbs and a view or two. There are many other potential options for enjoyable shorter or longer on-track walks in the area, including from the alternative access points. 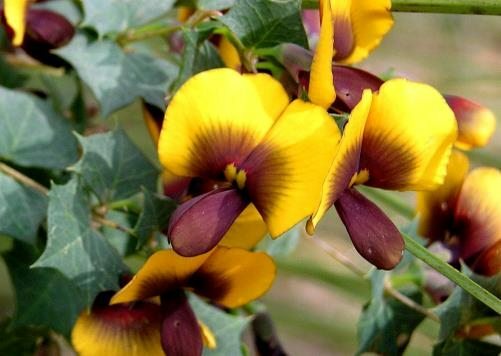 See WalkGPS Pickering Brook – shorter version Walk on this site for a shorter walk option. From the start point (waypoint ‘START’) in the carpark at Pickering Brook General Store, head westward to cross the branch of Canning Rd (at waypoint ‘01’) and follow the dirt track (which is along the route of the old railway to the Kalamunda Zigzag line) to cross the main Canning Rd (at ‘02’). After about 50m (at ‘03’) the old Kattamordo Heritage Trail foot-track crosses the track. Turn right onto the Trail and up the roadside embankment to cross Canning Rd again (at ‘04’) and enter the forest which is initially mainly sheoaks. You are now in the Korung National Park. 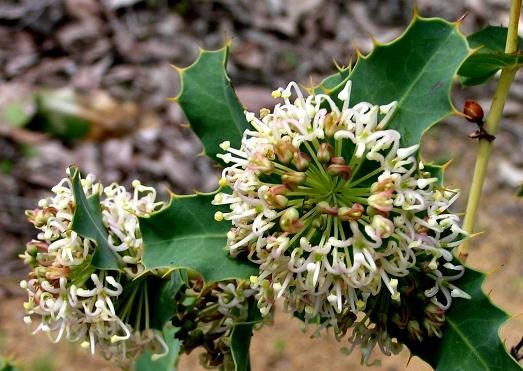 Relocate the foot-track which may be initially a little difficult to follow as it often becomes hidden under the layer of dry sheoak ‘needles’. Head northward, gently uphill. Ignore a track that veers off to the left after about 300m (at ‘05’) near the crest of the hill and soon cross Valencia Rd (at ‘06’). Continue along the Trail and pass another track junction (at ‘07’) before descending to meet Francais Rd (at ‘08’). Turn right to head SE along the road for about 100m, passing a fruit packing shed and orchard on your left. Re-enter forest (at ‘09’) just past the orchard boundary and head generally NE (via ‘10’) along the foot-track through a very pleasant section of jarrah forest. When the track divides at ‘11’, take either the higher or lower track down the hillside. The two tracks merge again at ‘11-1’. At ‘12’ the track veers NW and then descends near ‘13’ to cross the dirt road extension of Weston Rd. Follow the track northward, descending into Piesse Gully, with the boundary fence of an orchard on your right. About 100m to the right in the orchard you will also see the old Fernie cottage which was the home of one of the soldier settler families in the 1920’s. The track soon joins a dirt road near the crossing of Piesse Brook (at ‘14’). Continue northward up the road for about 100m. Soon after Valento Rd merges from your right, locate (also on the right) and follow a mountain bike trail which enters the forest at ‘15’. 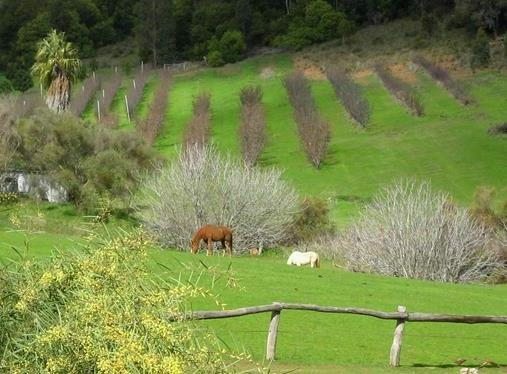 (You now leave the original Kattamordo Trail which continued northward uphill on the dirt road, with farmland and orchards on the left and forest on the right.) 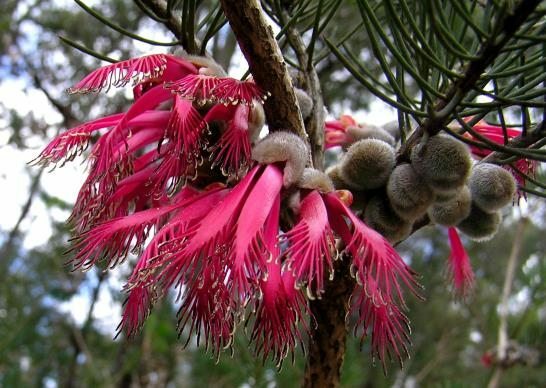 The bike trail initially climbs gently ESE-ward for about 400m, then climbs more steeply and more northward as it zig-zags up the hillside (via ‘16’ and ‘17’) through another nice forest section of mixed jarrah-marri-banksia. After ‘17’ the trail soon flattens onto a rocky lateritic surface and heads mainly NE-ward, crossing an old forestry track at ‘18’. (The original Kattamordo Trail (and sign) lies about 50m NW where it follows a track bounding adjacent farmland.) Continue along the bike trail (via ‘19’), crossing another old forestry road at ‘20, and veering sharply left (NNW) at ‘21’ to soon meet (at ‘22’) another old forestry road (which is also the route of the Kattamordo Trail). Turn right to follow the forestry track (via ‘23’) and pass through a junction with two other old forestry roads (at ‘24’) and continue ahead on the original Kattamordo Trail which re-enters the forest from the junction as a foot-track. Cross Patterson Rd (‘26). Soon after, the Munda Biddi Mountain Bike Trail joins from the right. Continue NE on the Trail and soon cross Walnut Rd (‘27’; The Perth Observatory is located 350m to the SE at the end of Walnut Rd). You have now left the Korung National Park. 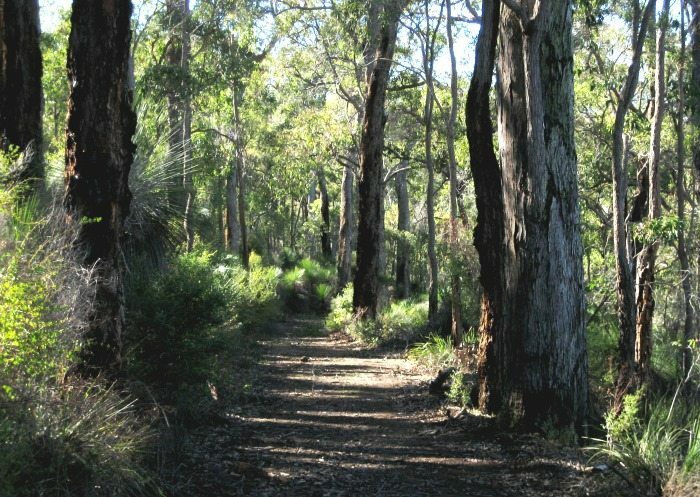 The Munda Biddi Trail re-enters the forest (State Forest) from a small cleared area close to the corner of Walnut and Lockwood Rds, then heads NNE through the forest for almost 500m, running mainly close and parallel to Lockwood Rd (to ‘28’), then reaching Gungin Rd (‘29’). Cross Gunjin Rd (old dirt road) to follow another mountain bike trail (not the Munda Biddi Trail) which continues initially NNE and then curves back generally northward. The bike trail soon descends a little then crosses a minor forestry track (at ‘30’). 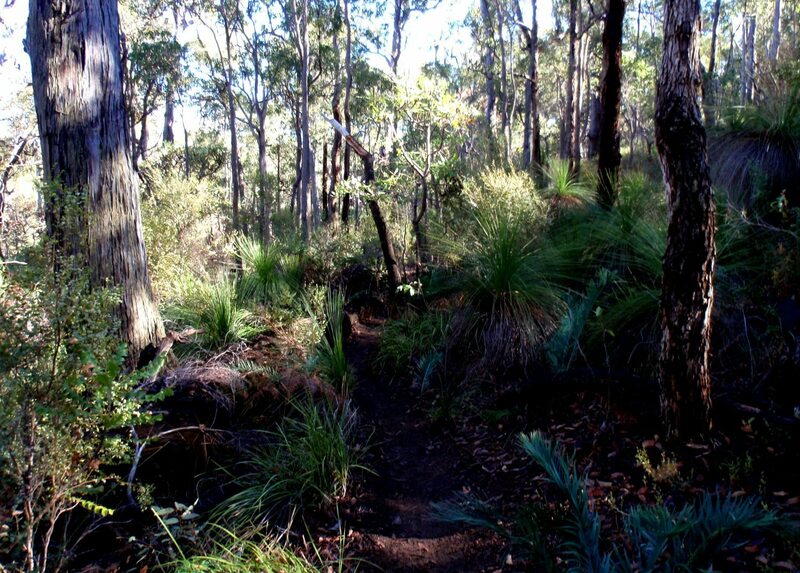 About 1km after the Gunjin Rd crossing, the trail climbs quite steeply over a distance of 400m to emerge from the forest at the SE corner of the Mt Gunjin summit clearing (at about ‘31’). Cross the summit area (‘32’) – which was the site of the former fire lookout tower – then follow Gunjin Rd NW downhill and turn left onto the Kalamunda Circuit track (at ‘33’). Continue quite steeply downhill on the track, passing the Little Ovens Trail turnoff on the right (at ‘34’; where you may also need to skirt around a mountain bike-jump set up across the track), and meet the Munda Biddi Trail again at ‘35’ (The Trail follows a forestry track here). Turn left to follow the Trail southward for about 700m, to a track junction (at ‘36’) soon after crossing a gentle gully. Stay on the MB Trail by taking the left turn at the junction and head WSW-ward up the hill to regain Gunjin Rd at ‘37’ after less than 1km. Veer right to continue uphill on Gunjin Rd and still on the MB Trail (via ’38’). After less than 500m veer right off Gunjin Rd at ’39’ to stay on the MB Trail and re-cross Walnut Rd at ‘39-1’. The 750m section from ‘39’ to ‘40’ is a re-walking of about 750m of the Trail already walked en route to Mt Gunjin. At the fork in the tracks at ’40’ veer left (southward) to stay on the MB Trail (the other fork follows the Kattamordo Trail). Cross Lockwood Rd and continue southward to a corner at ‘41’ where the trail bends sharply left and climbs eastward to a ridge. At ‘42’ the trail descends southward then swings sharply left (eastward) at ‘43’. Leave the trail at this point to continue straight ahead, southward, on an old overgrown vehicle track to reach Walnut Rd at ‘44’. Veer right to follow the road southward to ‘45’. Then veer right onto another old vehicle track to head SW back through the forest down a gentle slope. Re-cross Patterson Rd at ‘46’ and follow the vehicle track across a gentle ridge (via ‘47’) before descending increasingly steeply down the hillside toward Piesse Brook valley to a T-junction at ‘48’, overlooking a small farming property (a former orchard). Take the left fork to descend steeply down the hillside to ‘49’. Turn right (WNW) onto Forrest Rd (sealed) and pass orchards on your left, then the old 1920’s home of the immigrant Pollese family (just after the first gentle bend in the road). Piesse Brook runs along the valley almost parallel to the road just 100m downslope to the left. At ‘50’, at the junction with the unsealed Valento Rd, continue on the sealed road which becomes Repatriation Rd where it curves to the WSW. The road crosses a bridge over Piesse Brook and passes the entry to the Santora Arabian Horse Stud on the left. Leave the road at ‘51’ to re-enter the forest (and the Korung National Park) on an old forestry track which climbs initially steeply uphill from the south side of the road. It then veers SE-ward along the hillside via ‘52’. At ‘53’ turn right (SW) to take the side-track uphill and across the crest of the ridge at ‘54’. Then follow the old forestry track SW-ward downhill to meet a W-E vehicle track near ‘55’. Now rejoin Repatriation Rd (sealed) at ‘56’ and follow it WSW (via ‘57’) across another small valley flanked by orchards and fruit packing sheds. Then turn right (WNW) into Pickering Brook Rd (at ’58’) at the junction to get back to the Start point (via ‘59’). Car shuffle option: If you are in a group and have done the suggested car shuffle at the start of the walk (see under Access / Directions), you will have left a car at ’55’ and can now avoid the final 1.5km of road-walking to return to the start point. This reduces the walk length to 11.5km. Shorter route without car shuffle: If you are unable to do the car shuffle but still prefer to avoid the road-walking, then you have the option at ’50’ of bypassing Repatriation Rd and following the unsealed Valento Rd NW along Valento Rd back to ’14’ to re-cross Piesse Gully and then retrace your steps of the outbound route for about 2km to return to the Start point. This latter option will reduce the total walk distance slightly by about 0.5km. Follow Welshpool Rd to its end at the T-junction with Canning Rd. Then turn right to follow Canning Rd for 4km. Continue for less than 100m along the start of Pickering Brook Rd (where Canning Rd branches sharp right). Then turn off to park in the Pickering Brook General Store carpark on the right. Food and refreshments are available from the General Store at the walk start point. Car shuffle option: The final 1.5km of the route includes 1.5km of walking along sealed roads (Repatriation and Pickering Brook Rds) to return to the start point. This can be avoided (and will reduce the total walk length to 11.5km) if you are in a group with two or more cars and can then do a quick car shuffle at the start (leaving one car at waypoint ’55’ where a minor dirt road branches off Repatriation Rd where the road bends sharply left about 1km from its junction with Pickering Brook Rd. Via various old forestry vehicle tracks through the area (see WalkGPS map). These generally provide linkages over distances of less than 1km to the sealed and dirt roads in the area, including Walnut, Patterson, Forrest, Repatriation, Francais, Weston and Gunjin Roads. “Heritage Trail – Kattamordo”, Heritage Council, 1998. – This brochure provided an excellent 22-page overview of the interesting history along this 27km walk trail (and the Mason & Bird Heritage Trail). 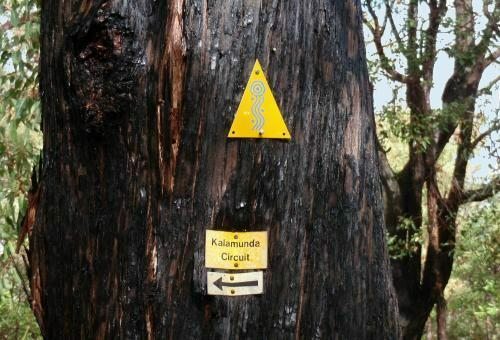 Note: The trail name Kattamordo replaced the Council’s earlier, incorrect spelling of the trail name as “Kattamorda” which was still often used and appears on most of the old trail signage. This trail has unfortunately not been maintained in recent years and has partly been taken over by mountain bike trails. Many of the old trail markers and signage have disappeared. Soldiers Settlement Scheme – For a summary of the history of post WW1 settlement along Piesse Brook, including the original Pollese and Fernie homes close to the walk routes. Brief history of the orchard industry in the area – A history of some of the best orchard country in W.A., going back to around the 1880’s. History of the railway – Includes a sketch map of the former Pickering Brook Junction station and surrounds just east of where the Pickering Brook General Store is now located near the corner of Canning and Pickering Brook Rds, at the start point of this walk. “South West WA 25K Scale Topo Maps”, Greg Harewood & Landgate, 2015. – Digital raster; ECW format on 16GB USB. See tiles #313-2133-IV-NE, #314-2133-IV-NW, #319-2134-III-SE and #320-2134-III-SW for relevant map coverage. Difficulty of the walks: The grading of WalkGPS walks takes account of various factors, especially distance, type of terrain and amount of off-track walking. Be aware that ‘Easy’, ‘Medium’ and ‘Hard’ are subjective grades and depend on the experience and perception of individual walkers. You must exercise your own independent judgment as to whether the walk routes suggested on this site are safe for you in the context of your fitness, training, skills and experience. Please read WalkGPS disclaimer. e.g. Mainly short distances on gentle terrain. Usually on-track. In most cases, GPS or compass is not required. e.g. Able to walk a minimum of 15km over variable terrain in a total of 4-5 hours without significant physical stress (in the cooler months). Reasonable navigation skills also required. These walks are often more than 15km and include variable terrain and/or a significant amount of off-track walking. Hard = Same as for Medium grade except includes more challenging terrain in part. GPS navigation is strongly recommended for most walks on WalkGPS, especially where there are sections of off-track (cross-country) walking. Walkers should be proficient in use of GPS before attempting those walks. In cases where GPS is indicated as ‘not preferred’ for navigation the walking will be mostly on existing tracks but GPS can still assist in locating correct track junctions and subtle turning points, or in following short off-track sections or tracks that have become overgrown. For all walks a compass and relevant map at appropriate scale should also be carried and the walker should be competent in use of map and compass. 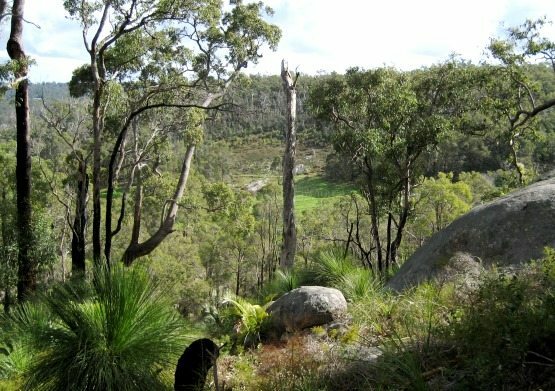 Mountain Bike Trails – Sections of this walk follow part of the Munda Biddi Mountain Bike Trail and other trails that have become very popular with riders in recent years. Take great care to look out for, and give way to the riders. A walker will be accepted on these trails by most cyclists if the walker shows commonsense courtesy and recognises that cyclists may rightfully claim priority and must always be given full right of way. Farm and orchard clearings in valley. Munda Biddi Trail and other mountain bike markers.